The ThinkPad X131e might be on its way to the market by as a leak reveals its specs of the device. Although most of the manufactures might believe that the days of Netbooks are over in the current market but Lenovo seems to still believe that Netbooks may still do a good business in the market. Lenovo has been spotted to be on their way in releasing a new Netbook called the Lenovo X131e, which can also be called as the successor of X130e. The predecessor was a device running on AMD’s Zacate Platform. However this device has a lot of new additions as the new Brazos 2.0 APU, featuring either an E1-1200 or E2-1800 CPU. This device is really boosted with Radeon HD 73xx graphics card. This device will also be available for the users with the optical ULV core i3 processor as an option. The design of this device is not very different for its successor as it is of 11.6inches and its display is capable of providing 1366x768 pixels of resolution. This device will have a lot of options that will include a dual core E-1200 clocked at 1.4GHz or an 1800GHz device running at 1.7GHz. There is also another option with the Sandy Bridge core i3 ULV PU which is also equipped with an HD 3000 GPU. The device is expected to have an 8GB RAM, even other specifications like two USB 3.0 ports and HDMI ports, VGA port and 4 in 1 card reader. The hard drive and or the storage of the device have three options as 320/500GB of hard drive or a 128GB SSD. Till now nothing has been said about the device about the price of the device but it is being expected that the product might be on the range of around $500. 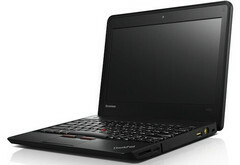 According to Lenovo’s website the device might get into the market by September of 2012.